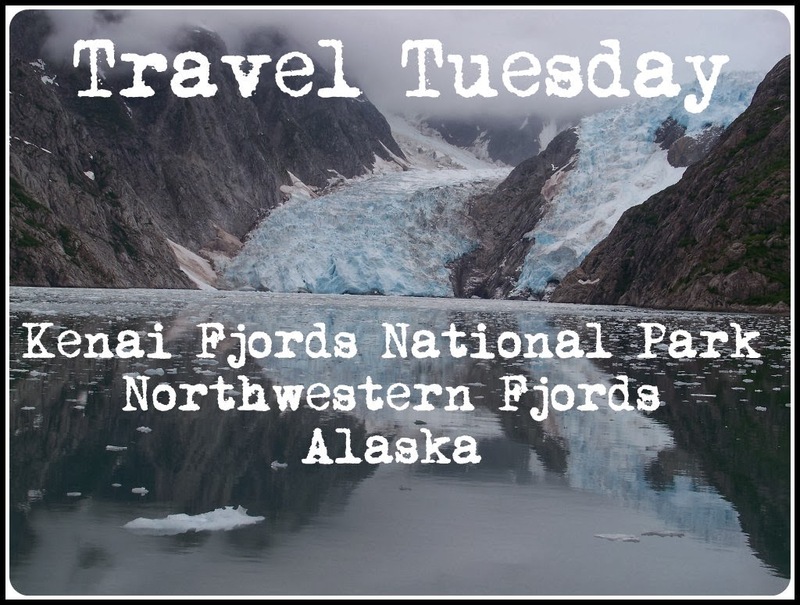 Today for Travel Tuesday I am taking you on my adventure through Kenai Fjords National Park, and Northwestern Fjords in Alaska. This was a hard one for me to do, because I took hundreds of pictures, and selecting just a few was difficult. Also, when I went, we saw so much on all the miles we drove with the boat, that I decided to break it up. So later on I'll write other posts about the other area's around the Aleutian Islands and the other glacial bay area's and abundant wildlife. Today the main focus in the National Park, will be near the Northwestern Fjords area. First, we took a one day boat cruise. 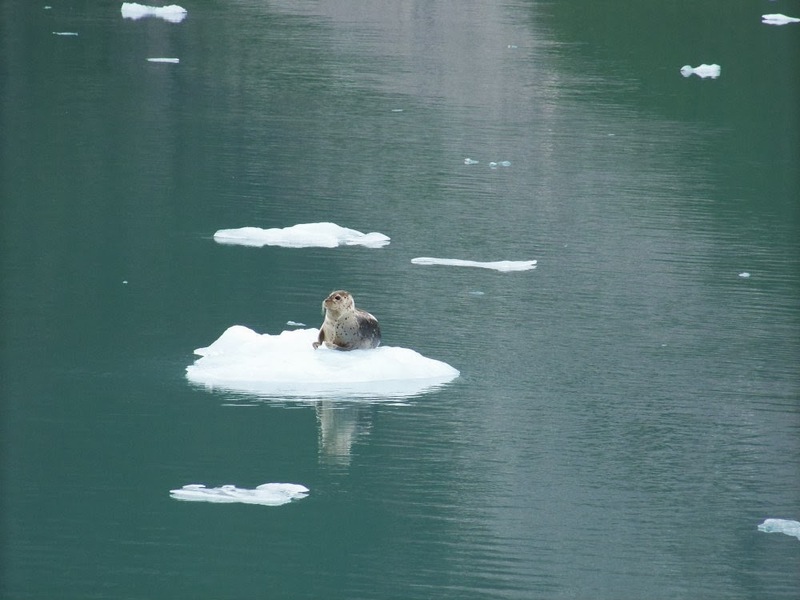 These are in smaller boats, and we departed from Seward, Alaska in the morning. The great thing about smaller boats (versus when you take the bigger cruise line boats) is you get the chance to get in and see things that you never would from the larger boats. 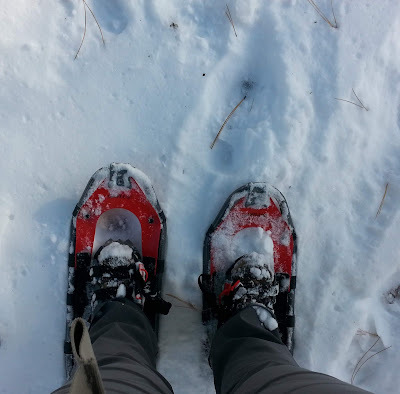 You get to go near the coastal shore, get close up to the glaciers, really close!!!! As you head out, into the different inlets and coves around the Fjord and National Park it is absolutely beautiful! I went in June, and although it was a cloudy day, it was pretty much the middle of summer. The time of year that the mid-night sun is out! 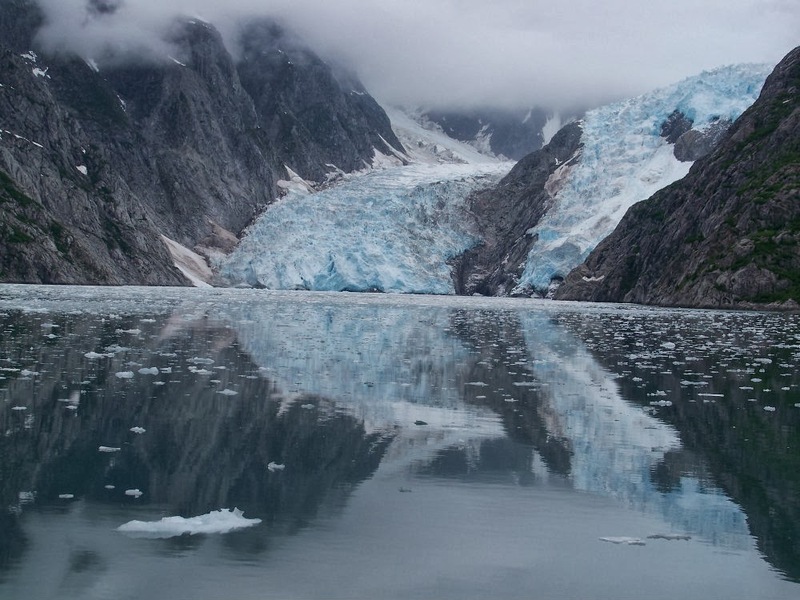 There are over 40 huge glaciers that flow into the sea, from within the National Park. 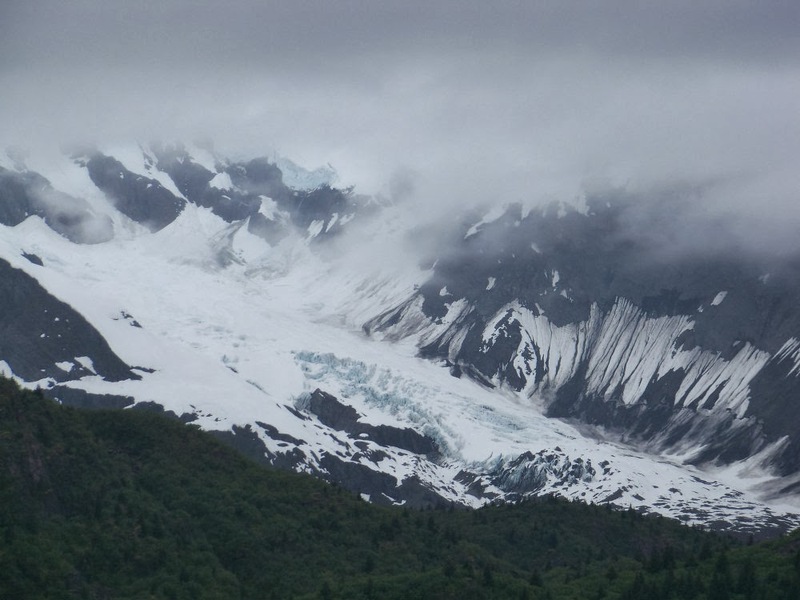 Behind these glaciers is the massive Harding Ice Field. The waters in this part of the sea are abundant with wildlife. The forests around them are massive and lush. Yes, you read that right lush! Some of the islands and coastal lines are really lush, beautiful and full of lots and lots of green. In fact, if I didn't know I was in Alaska, and if the temperatures at certain places weren't cold. I would have thought I was in lush islands like I would expect to see in Hawaii. They really are that beautiful and green, my pictures do them no justice! I mentioned wild life. I saw ton's on this water trip, far more than I will share in pictures in this post. I'll save some of them for other area's I will write different posts on. 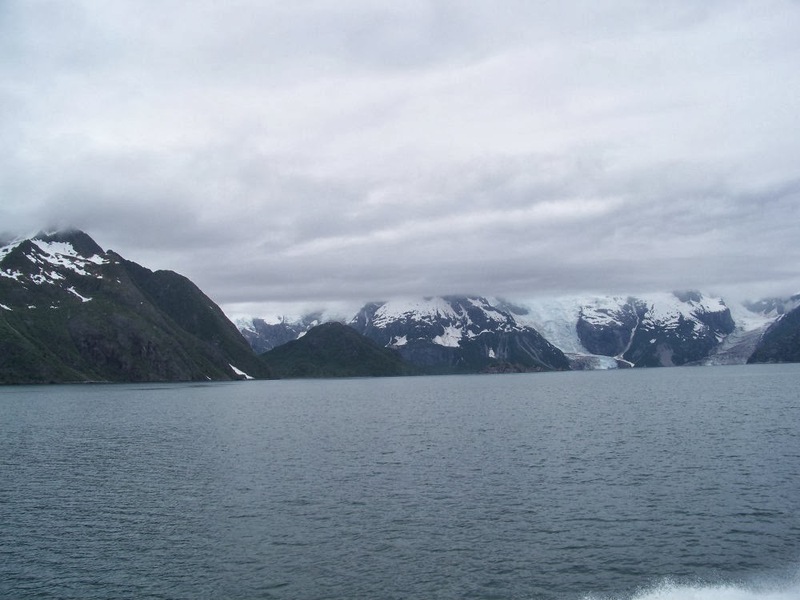 But as we were making our way to the Northwestern Fjord, we passed island after island. Some lush and green, others stone and ice. 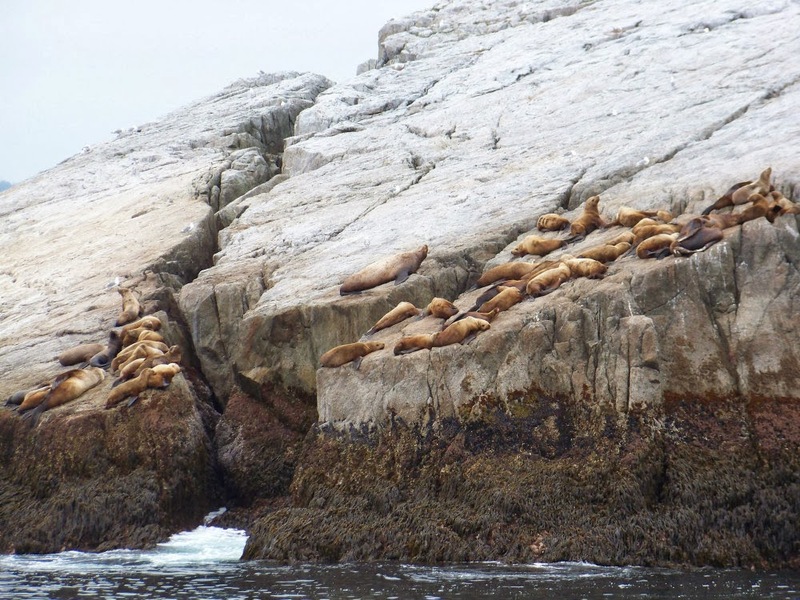 Here are a bunch of Sea Lion's soaking up some sun on this huge island rock. You can see the cracks and the molding of this rock, it was obviously at one time covered in a glacier and you can see the results after. 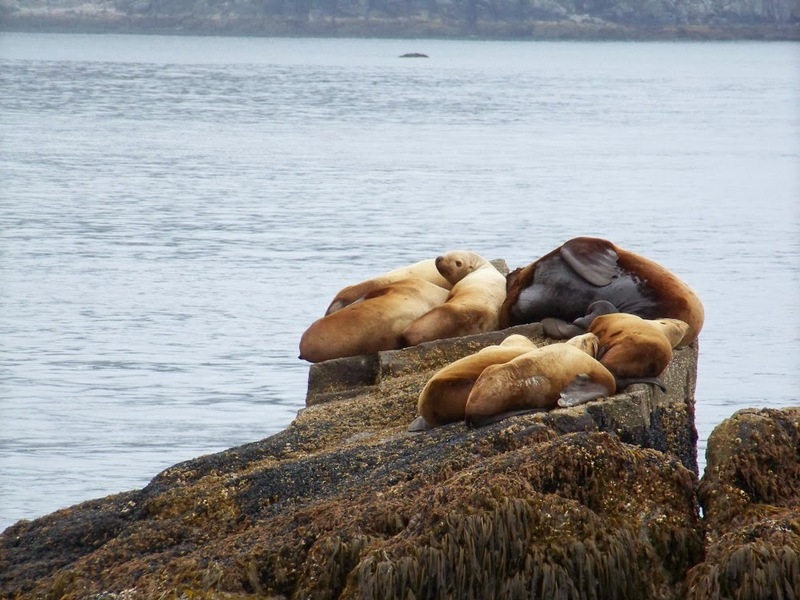 If your wondering how the Sea Lions get onto these rocks that are so far down from the water. One factor has to do with the tide, it was obviously lower at this particular time of day. But they also ride the waves up and can jump from them many feet and scoot they cute bodies up onto them! Glaciers in a way move like a frozen river. For instance the picture above, was taken from quite a distance away. The glacier you are looking at is miles long, and likely a few miles deep in ice. Behind it, where you can't see because of the clouds is the Harding Ice field that keeps the supply of ice coming, as ice takes the slow route to the ocean. I added this picture to give you some emphasis on the waters in this area. They are a beautiful aqua blue. Not for the same reason as you get in the Caribbean. 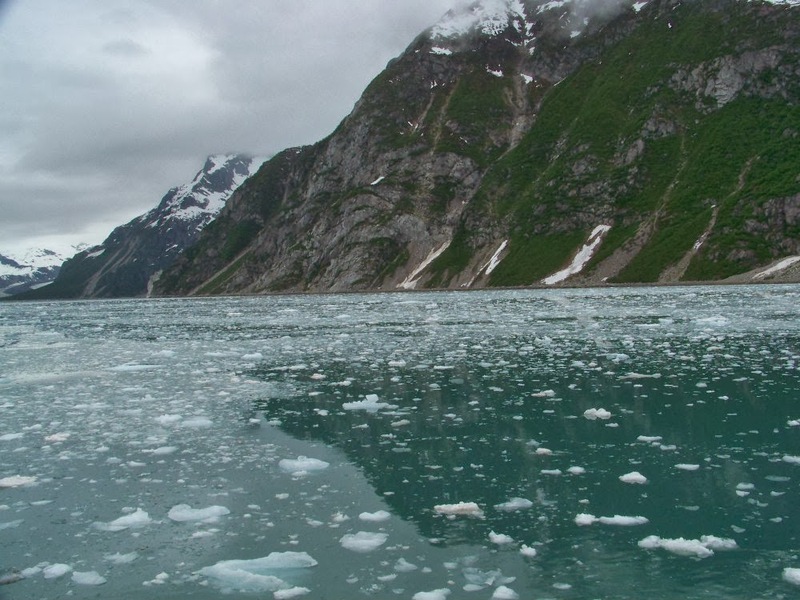 But because the water is literally just above freezing, and what resides in it and below it are massive chunks of ice from the coastal glaciers. This cute little guy, came up to say Hi to us! It is amazing that they love to hang out in these freezing waters! But if we had that much fat on us, we probably wouldn't mind it either. Okay, so I forgot to mention, we were the first boat of the year allowed in the area. Even the day's prior, these waters were frozen solid. We just lucked out, that the ice was breaking up. Our captain headed into this area pretty slow. Pretty much like a slow float. He would literally inch forward at times and then stop for a minute or two, before inching forward a little more. I wanted to show you this picture above for a reason. You can see a bit more detail of the large ice chunks. Imagine being in a city, and looking up at skyscrapers, like in New York or Chicago. Those chunks of ice, each individual chunk is like the size of a building. The smaller pieces that look like smaller ice balls, are actually the size of huge homes. I know it may not look like it, but the reality is, it is massive and amazing! This particular coastal glacier above, although it looks like dirty snow, its a solid wall of ice. Well I probably shouldn't say solid, because the thing is moving! Some people could sit and watch it for hours or days and see nothing. Others get to see a lot of activity. I was fortunate enough to see a lot, and I mean a lot of activity. The calving process to watch is amazing, as it is to hear. Huge pieces of ice, the size of large homes and tall buildings, crack like thunder and then rumble and fall down. Sometimes these trigger more and more. When it hits the water, it can create little splashes of things just sliding down into the deep, to huge splashes that can even knock over boats. On this particular day, we hear lots of coastal glaciers crack and break and drop into the ocean! I loved it! The captain of our boat would cut the engine and we would all sit in silence and just listen and wait. 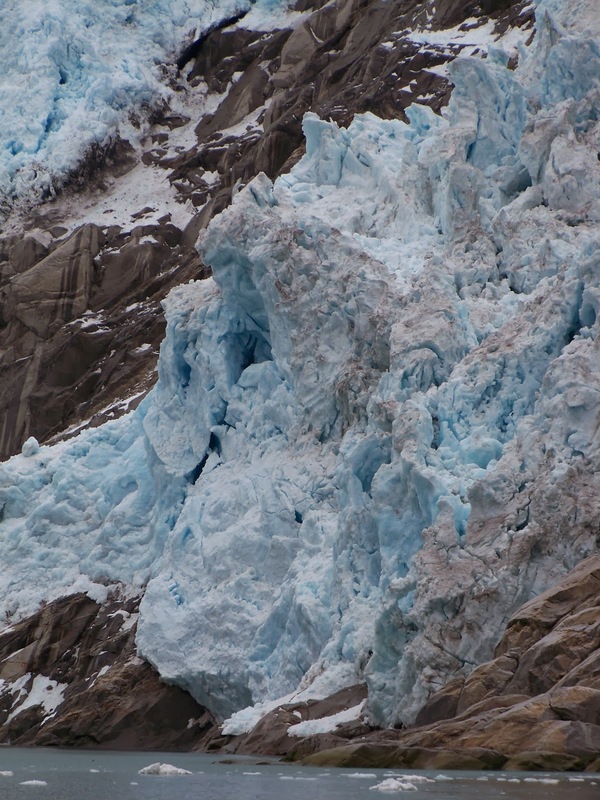 I have some great video of the calving glaciers. But even though I held my camera ready, it's kind of hard to see the process in a picture. This one above is probably the best that shows. In the picture it may look like an ice waterfall. But what happened just before was amazing. Up a ways above this shot, probably around 1/2 a mile or more, was a series of loud thunderous cracks, as not just one, but many huge massive pieces broke off and dropped a ways down the mountain. Triggering more and more. We watched as calving, after calving took place and you could see these huge pieces fall, hit others and move down. By the time it got closer to the ocean, large pieces the size of homes would fall into it, and then a steady stream of ice snow would waterfall into the waters. 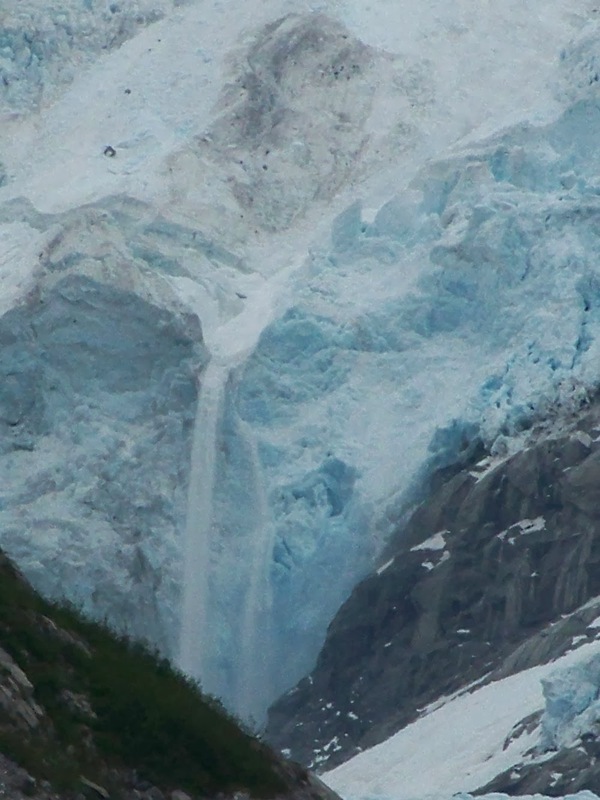 The waterfall of ice would last 30-45 seconds as it cleared from some of what dropped above. This is one of those things, that if you ever get a chance to do, you should do it. It's amazing! This shot above is one of my favorites. 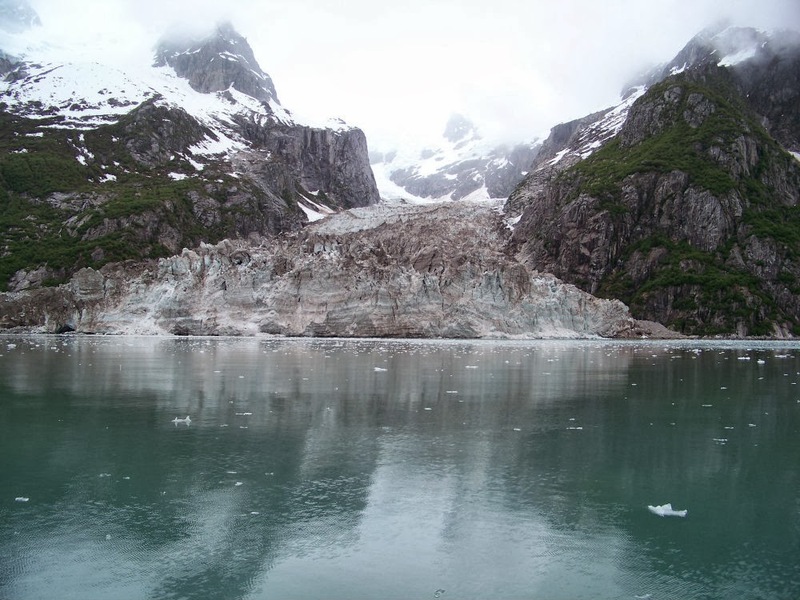 The captain slowly brought us right up to this glacier, 20 feet away at one point as the boat drifted towards it. But this shot from a distance was my favorite. This coastal glacier was the one that I saw the most activity from. The captain brought some of the ice on board so we could feel it (for the fun of it), let's just say I would not want to have to dive into that water. This was the furthest anyone had been so far that year, and I loved that we got to be the first to get in and see it. Each year the glaciers change, so to be the first that year, meant we really did get to see it before the rest of the summer tourists came in. I loved that! 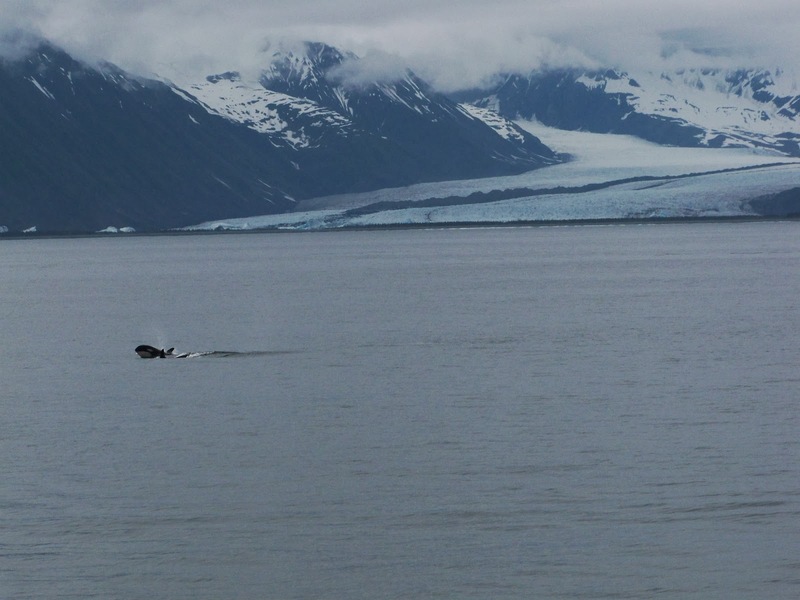 I mentioned above that we drifted in closer to the coastal glacier, this is one of the shots when we were about 30ish feet away. Those chunks that look like they are ready to fall, may look small in the shot, but they were huge! These are some of the shots, as you are traveling out. You can tell we are more out in open water by the waves. 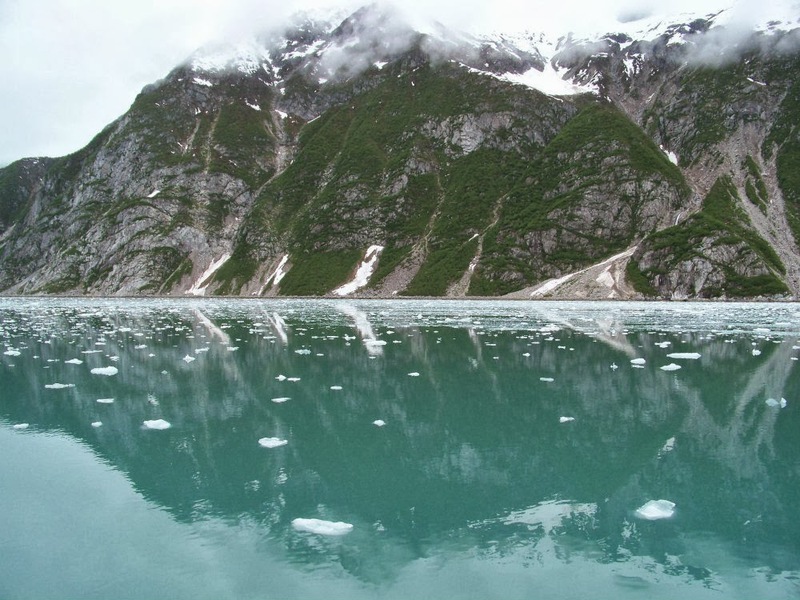 When we were in the large inlets next to the coastal glaciers, you can see the water is more calm. We saw lots of Orca's and Humpbacks on this trip. So I thought I would show you at least one of them, with the backdrop of Bear Glacier. 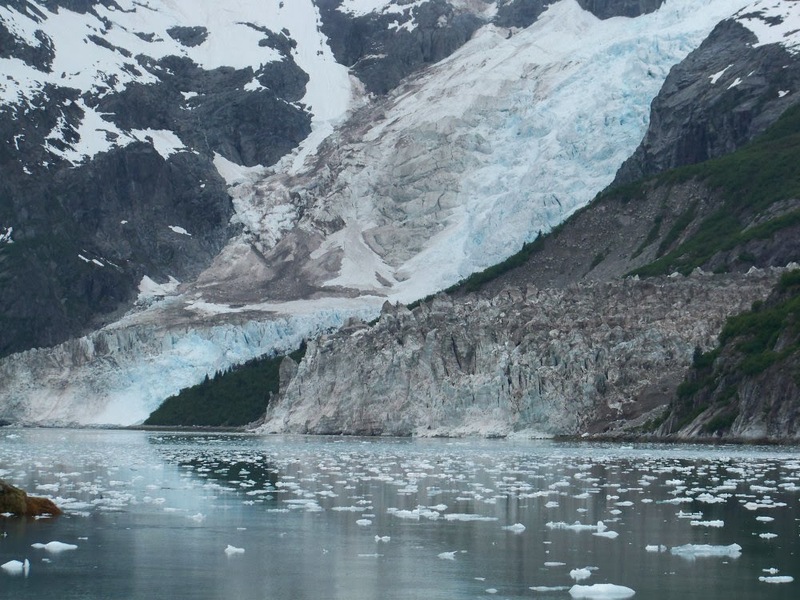 If you have more time, you can Kayak closer to this glacier, and really get up close and personal with it. I mentioned lush forests. We traveled into this inlet, that on top of these mountains that go thousands of feet high are glacial lakes. 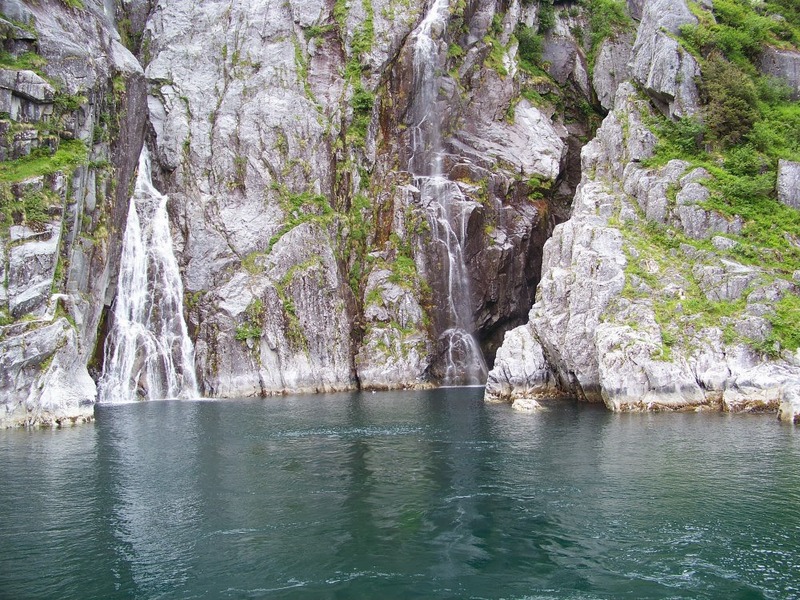 These lakes that drop down over the rocky slopes create massive water falls. The above picture, although you can't really see it in the size I am showing you. Has at least 50+ water falls, that drop 100's if not 1000 feet at times. In these area's you can see animals, I saw a dozen big horn sheep resting on the rocks. Same mountains as you saw in the previous picture. This is just a small area, we were too close the camera couldn't get the entire mountain in this close up. What you see is about 75 feet of it. 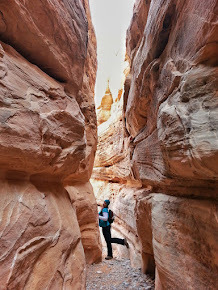 As I tipped my head up, I was surrounded by 120 degree's of 1000+ foot cliffs and 50+ waterfalls pouring around me. It was amazingly beautiful!!! 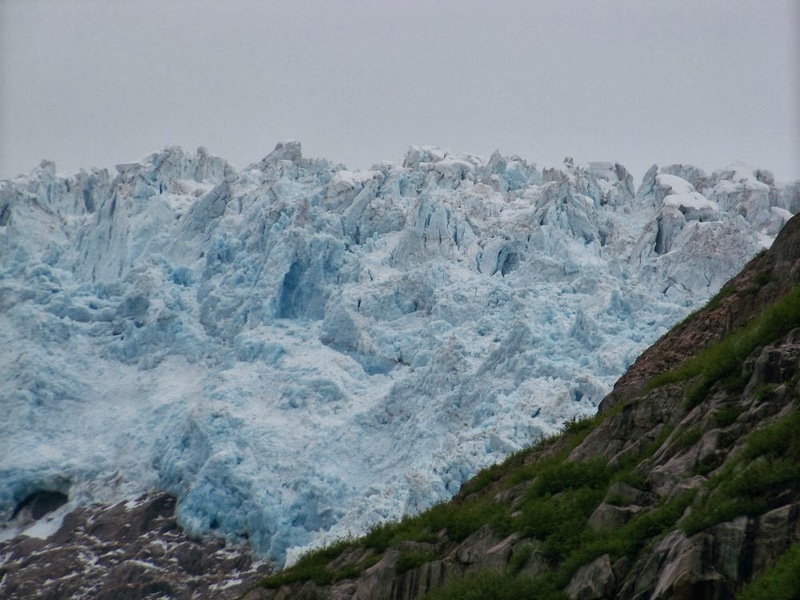 If you go to Alaska, I highly recommend taking some time to visit some Coastal Glaciers, they are amazing! 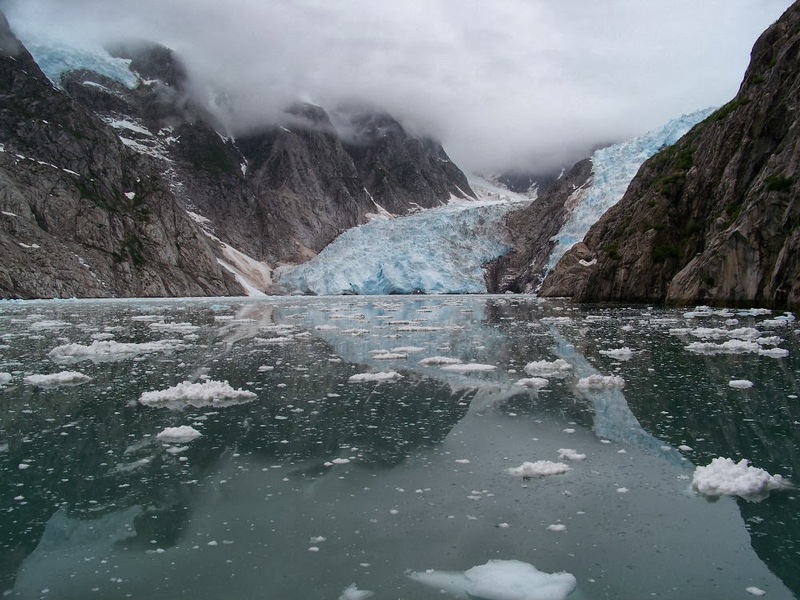 The best part about Alaska is they have over 100,000 glaciers! Yes, it is true that some of the glaciers get smaller each year, that is just the regular process that earth has seen for millions of years. But on the bright side, not all glaciers get smaller each year, in fact some get larger each year. Above is a blow up map of the region. You can see in the tiny corner state map, the area in red is the area I visited for these pictures. The area in green in the larger picture is the National Park. 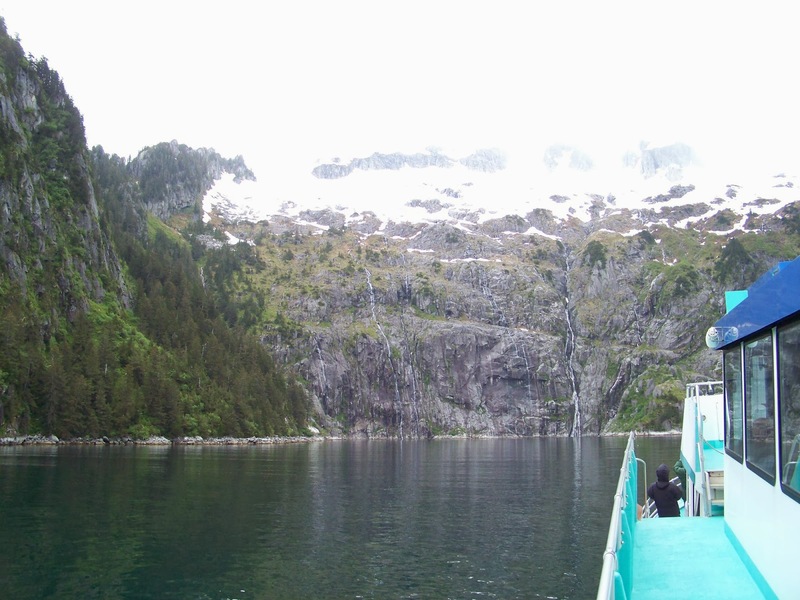 My boat tour took us from Seward, out of the Bay and down around the different arms and into the different Fjord areas. 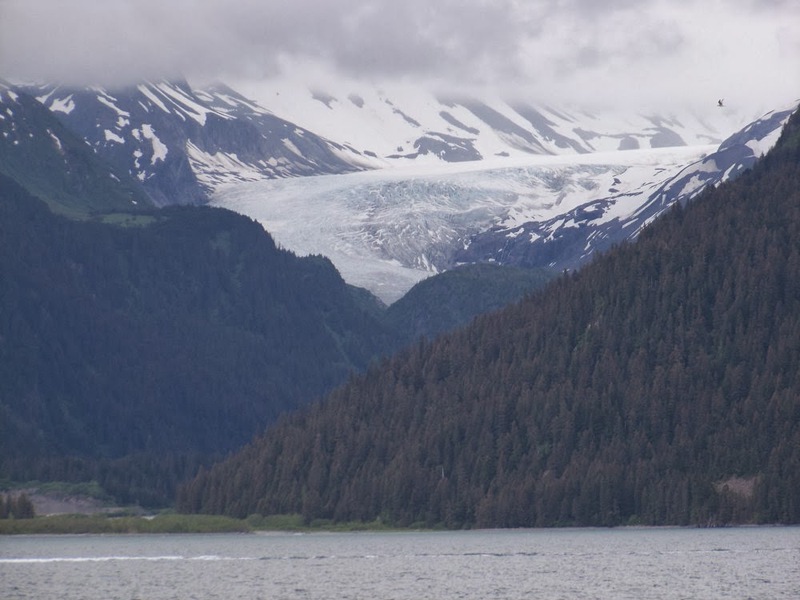 * These particular shots are in Kenai Fjords National Park, Northwestern Fjords area outside of Seward, Alaska. * You can only get to these area's by boat. * Chances are if you take a large cruise ship, unless you dock for an excursion, you won't get to see these things up close, you'll need to take a smaller boat like I did. * These tours last 10-11 hours, and depending on the price you pay, depends on how far out they'll take you. 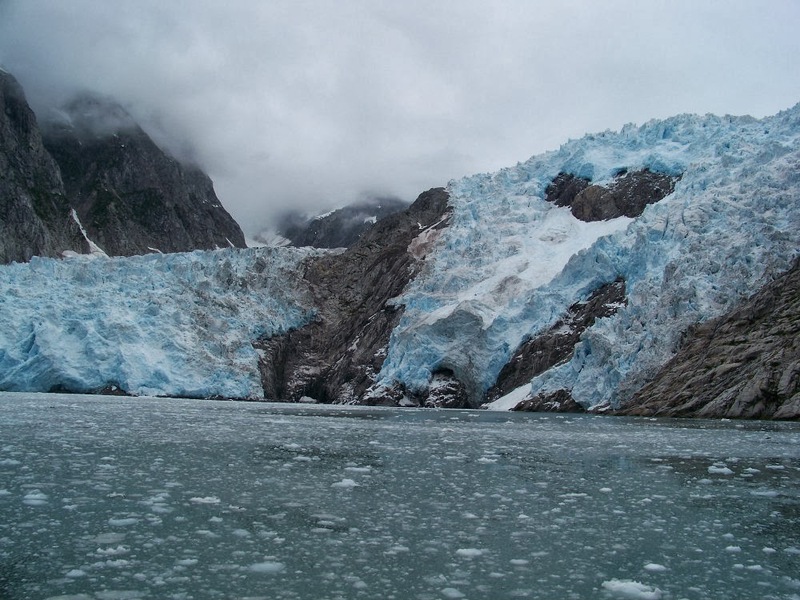 * Good news, there are many other area's in Alaska that you can also go to see Coastal Glaciers. * To get to this area, I flew into Anchorage and rented a car and took the scenic HWY drive to Seward. * The sun is out almost 24 hours a day this time of year, so you can go out and see these things anytime you want. 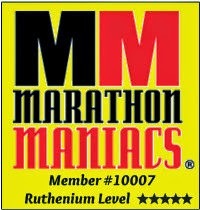 However, certain tours only operate at specific hours. * You won't be disappointed!